A controversial decision to require large food franchises to pay workers a $15 minimum wage in New York State got final approval Thursday, after the State Labor Commissioner signed the order. Capitalizing on the moment, Gov. Andrew Cuomo said he would now push for New York to become the first state in the country to impose a statewide minimum of $15 an hour. 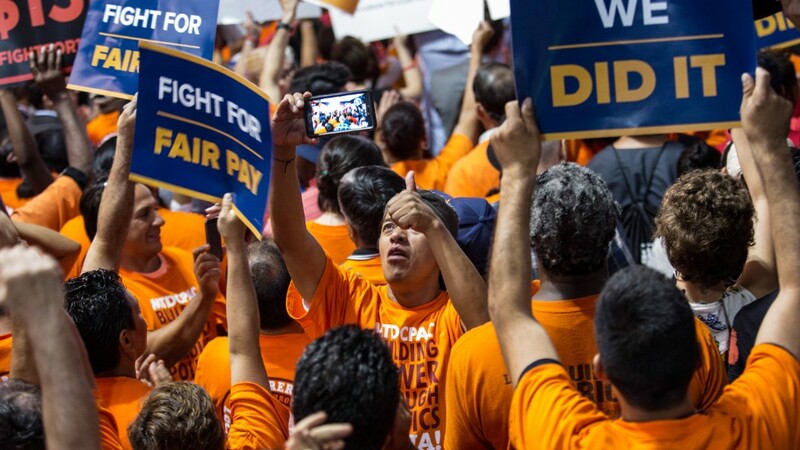 "Raising the minimum wage to $15 an hour will add fairness to our economy and bring dignity and respect to 2.2 million people, many of whom have been forced to live in poverty for too long," Cuomo told workers gathered at the Javits Center in New York City. The governor was joined at the event by Vice President Joe Biden. To date, only a handful of cities -- including Los Angeles and Seattle -- have approved a $15 local minimum, although others may follow suit in the next year. It's not clear how successful the governor will be in his push to raise the state minimum, which currently is $8.75 and will rise to $9 an hour next year. Such a large increase is likely to face an uphill push in the state's Republican-dominated Senate, said Irene Tung, a senior policy researcher at the National Employment Law Project. In the meantime, an estimated 135,000 to 200,000 fast food workers and cashiers in New York State will see their hourly wage rise gradually to $15 by the end of 2018 in New York City and by 2021 in the rest of the state. Fast food chains that operate in more than 30 locations nationwide are the sole target of the new wage order. It's estimated to affect 116 franchise fast food brands. But the cost may be borne by consumers and small business owners, as well as some employees. Restaurant owners are not happy with the increase, or the fact that it was decided on by an unelected three-member wage board. "We are disappointed with the decision today to sign off on a recommendation from a wage board that was created to target a single industry and will cause a host of negative unintended consequences," said Melissa Fleischut, president and CEO of the New York State Restaurant Association.